Montana’s warm-heartedness is as unbridled as its skies. Will’s Shed provides a fitting place for the art center’s neighbors and visitors from afar to sip, sup and mingle. Photo by Erik Petersen. 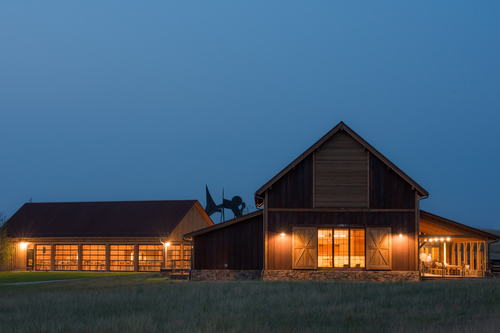 Designed by architect Laura Viklund and crafted by Gunnstock Timber Frames, Will’s Shed is the most recent addition to Tippet Rise, nestled between the Olivier Music Barn and the artist residences. In keeping with the spirit of the surrounding buildings and the region’s agricultural heritage, the structure employs a classic barn form and is traditionally timber framed out of Douglas fir. Two sides of the building are clad in operable doors made of steel and glass, allowing the structure to close in inclement weather without sacrificing the incredible views of the Beartooth Mountains. 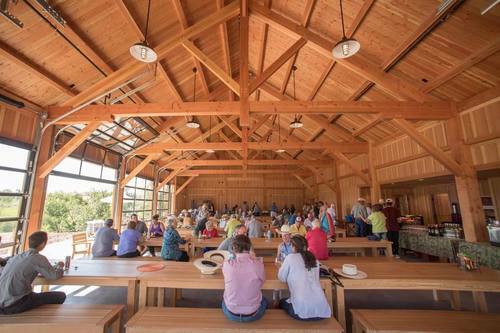 While the Olivier Music Barn is designed for sublime musical experiences, Will’s Shed provides a more casual space for dining, education and community events. Sidled against the Olivier Music Barn, Will’s Shed (left) is the most recent addition to the Tippet Rise landscape. Photo by Erik Petersen.